When it comes to referral campaigns the keyword is “engagement”. Companies that keep their participants engaged throughout the entire campaign show a far higher referral rate that companies that don’t. It doesn’t matter how sophisticated and exciting your referral campaign is. The majority of people will sign up and forget about it. Their attention will be highjacked by the next cat-meme, Youtube video or Whatsapp text. We live in an incredibly fast-paced world where everybody is screaming to get your attention. When planning your campaign you must keep this into consideration. However, you should not make the mistake of thinking that the solution to this problem is shouting louder than the others. 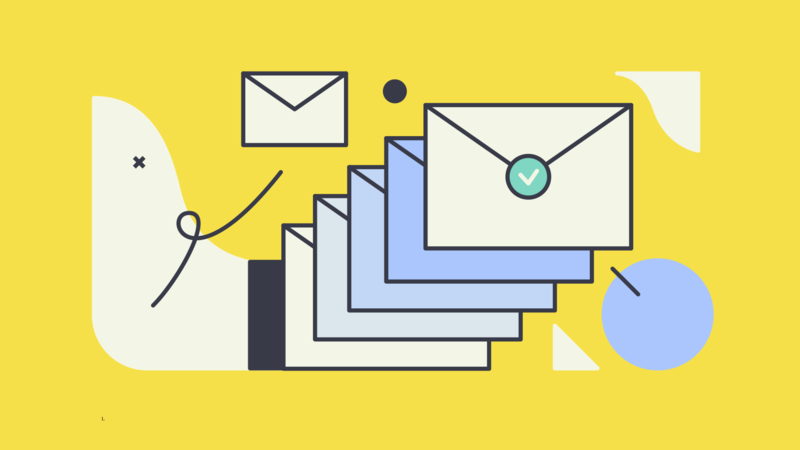 We have spent a lot of time thinking about this problem and we came up with a fairly simple solution: behaviour-based emails. Behaviour-based emails are sent when something “happens”, for example when people sign up or successfully refer a friend. Sending emails based on events is a better approach than sending them at random times because 1) people are more likely to expect them and 2) there is (almost) always an emotional load attached to them. Automation emails help you re-engage with your subscribers when they are more likely to forget about you. We have 5 different types of Automation emails and we add new ones all the time. The Welcome email, as the name suggests is sent right after a person signs up to a referral campaign. 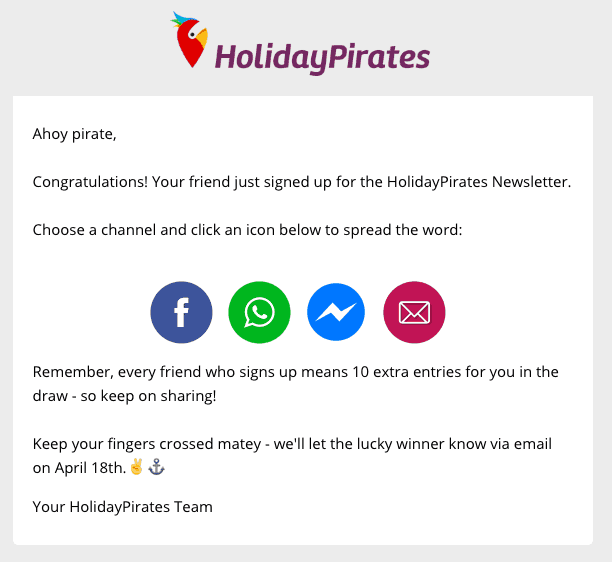 This email is generally used to thank people, remind them the rules of the competition and to share their link. The Follow-up email is sent a chosen amount of time after a subscriber signs up (eg: 6 hours or 2 days after sign up). 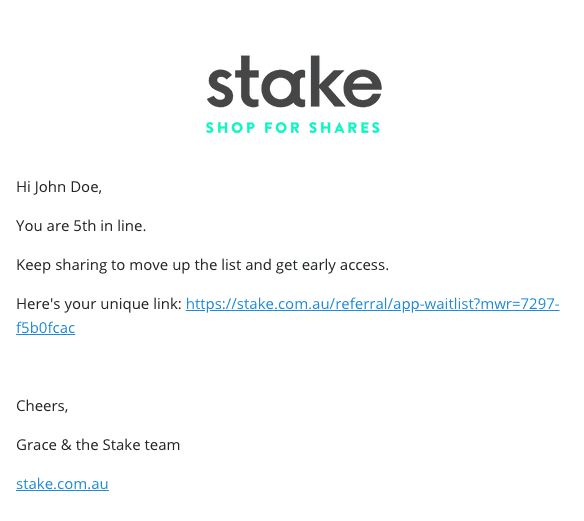 This email has a dual goal: inform the subscriber of their status (ie: their position on the list, how many people they have referred, etc) and remind them of why they should keep sharing their link (“only the top 10 people will win!”). The Milestone email is sent when a subscriber refers a specific number of friends (ie: 5 people). Use this email to congratulate this person and maybe to send a special coupon code(we’ll talk about this later). When writing this email think about the emotional load your subscribers will experience: they will likely be happy and excited. That’s a great opportunity to nudge them into keep sharing their link. The Referral email is sent to a subscriber when they successfully refer a friend (ie: Alice signs up through Mark’s link; Mark gets the Referral email). You should use this email to congratulate them and remind them to keep their eyes on the prize (quite literally). The Referred email is sent to a subscriber who has been referred (ie: Alice signs up through Mark’s link; Alice gets the Referred email). This email is normally used for double-sided referral programs (“Give $10, Get $10”) and giving away coupons of access codes (we will see that in a moment). If you are familiar with merge tags you will find them very easy to use in ReferralHero’s Automation emails. If you don’t, don’t worry. Merge tags look like a snippet of text that ReferralHero replaces with the dynamic content the merge tag refers to, like subscriber name or email. For example, you can write “Hello %name%” in the body of your email and ReferralHero will replace %name% with the name of that specific subscriber. There are over 30 merge tags that you can use. Another advanced feature that comes built-in with ReferralHero’s Automation email is the possibility to send a unique coupon or access code in the email. 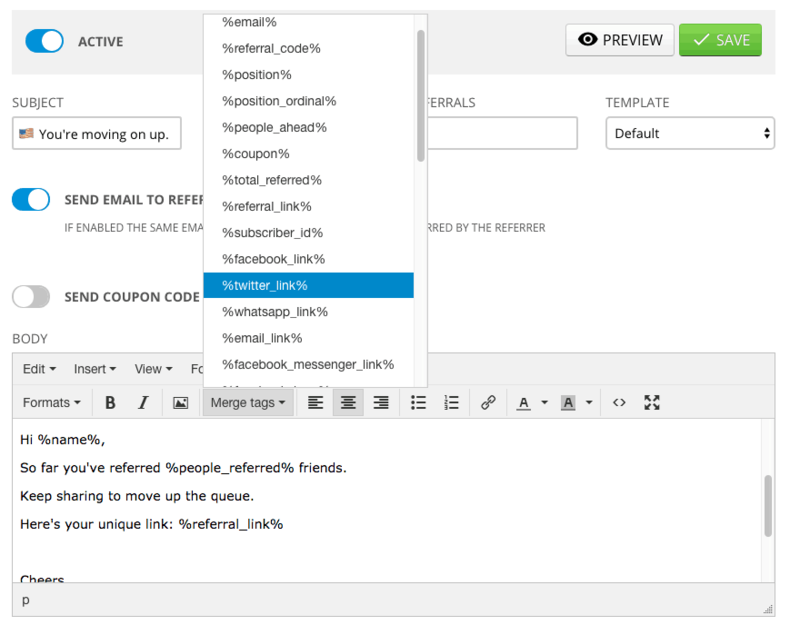 You simply need to upload your codes in ReferralHero and then use the %coupon% merge tag in the email. ReferralHero will automatically pick a random code from your list, put it in the email and remove it from the list so that you one code can only be sent to one person (hence making it impossible for people to share their coupon code). You can also upload as many lists as you want so, for example, you can send 10% OFF coupons in the Milestone email and 5% OFF coupons in the Referred email. These are quick suggestions that you should ALWAYS keep in mind, but they are particularly useful for a referral campaign. Infuse your personality in every email. Make each email you send to your subscribers funny and engaging. People are not stupid robots that do what they are ordered to do. Build a relationship. These are not one-off users. You want these people to stick with you and your business as long as possible. Treat them nicely, build a relationship and you will win them forever. Extend the conversation to your social media accounts. Why stop to emails? Engage with people who tweet about your campaign, follow them on Instagram, mention them on Facebook, etc. Keep it short & snappy. People don’t like to spend time in their inboxes. Make them engage with you as quickly as possible. The shorter the interaction, the more likely you are to get results. This post is about automated emails but keeping your participants engaged is not just about automation. We highly recommend you to keep in touch with your community regularly, for example by sending them a newsletter every 1 or 2 weeks. 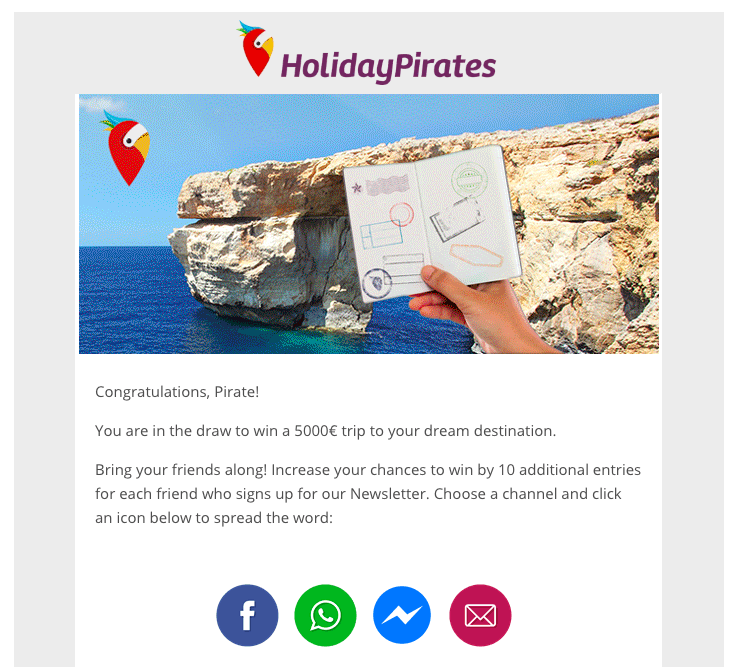 Another quick win is to send a newsletter a few days before the end of the competition for the last push.